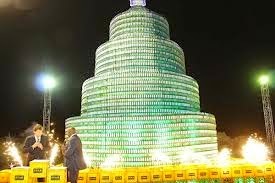 The record breaking bottle tree, which is situated along the Eko Atlantic stretch in Victoria Island, Lagos, venue of the much anticipated Lagos Countdown 2014, is made of empty beer bottles. The tree is part of the side attractions for the annual New Year Lagos countdown organised by the Lagos State Signage & Advertisement Agency, LASAA, and Star beer. Speaking at the press conference held on Wednesday to officially unveil the tree, the managing director of LASAA, George Noah, said the tree stood as an iconic landmark in Lagos. Walter Drenth, the marketing director, Nigerian Breweries Plc, said he was humbled by the attraction to the Star bottle tree by Lagosians and those who appreciate creativity. 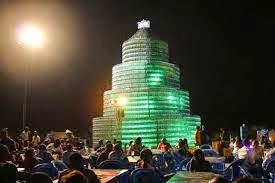 The record-breaking tree is made with a total of 8,000 star beer bottles as against 3,000 bottles announced during the commencement of the project. 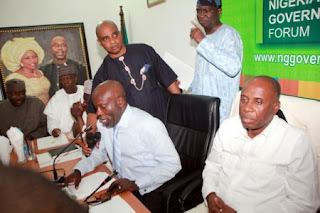 The Lagos 2014 countdown, a month long celebration which kicked off December 1 will end with a musical and comedy concert on December 31 into the New Year with the Lagos state governor, Babatunde Fashola and members of his government in attendance.